The Florida Marlins have been one of the most unusual franchises in the history of baseball. They have only been in existence for 19 years and have had really highs and dramatic lows. They have captured 2 World Series Championships, the first in 1997 and 2003. They have also had some of the worst teams in recent memory. Their 1998 squad was the first team to lose over 100 games after winning the World Series. The Marlins have been up and down since their last title. I have decided to use the technology available today with sports simulators like Whatifsports.com to find out what Marlins team was the greatest. Before that I will give you an idea what we have here in each team, so let’s take a look. The Marlins entered their 5th season with high hopes. The field was full of great players of that time. Bobby Bonilla came in as the big free agent acquisition from the previous off season. The squad also had the hard hitting Gary Sheffield, “Mr. Marlin” Jeff Conine and the best fielding catchers of that season in Charles Johnson to name a few. This Marlins team was assembled by then owner Wayne Huizenga to turn the tax payers of Miami onto the idea of funding a baseball only stadium. That did not happen but the team did accomplish the unbelievable. The Marlins swept the San Fansisco Giants in the N.L. Divisional round and headed into the N.L.C.S. versus a very dominant Atlanta Braves team. The Marlins won that series in 6 games. The most memorable game of that series was when the rookie Cuban defector Livan Hernandez throw for 15 strike outs in game 5 and defeated one of the best pitchers of the day in Greg Maddux with a 2-1 victory. The Marlins charged into the World Series against the Cleveland Indians. The Marlins won the first game which was played in Miami in the state of Florida’s 1st World Series Game. The teams kept switching off wins the entire World Series. 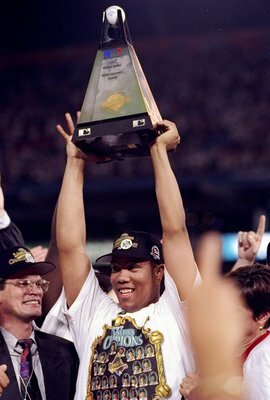 In game 7 of the 1997 World Series the Marlins came out on top when Edgar Renteria batted in the winning run in the bottom of the 11th, which was the mid season acquisition of Craig Counsell. This team was a great on e and will go down as the state of Florida’s 1st World Series Champions. This Marlins squad was built a lot in part to the 1998 fire sale. One of the players received during the sale would end up being the 1st baseman from the 2003 championship team Derek Lee. Many of the draft picks acquired during that time drafted many of the players on this championship team. When the season started the team did not have very high expectations but was expected to fair better than they did in the first two months of the season. The Marlins had a record of 16-22 when manager Jeff Torborg was fired and replaced by 72 year old Jack McKeon in May. The season was about to turn around in large part to mid season call ups Dontrelle Willis and Miguel Cabrera. The team which also acquired veteran Jeff Conine back during the middle of the season made it into the playoffs through a wild card bid. Like the team did in 1997 this team beat the Giants in the Divisional Playoff Series to advance to the N.L.C.S. to face the Chicago Cubs. The Marlins won the N.L.C.S. against the Cubs in 7 games. The team was almost eliminated in game 6 but had a miracle in the late innings of the game and were able to stay alive until game 7. The World Series had the Marlins in the usual spot as the underdog against the New York Yankees. 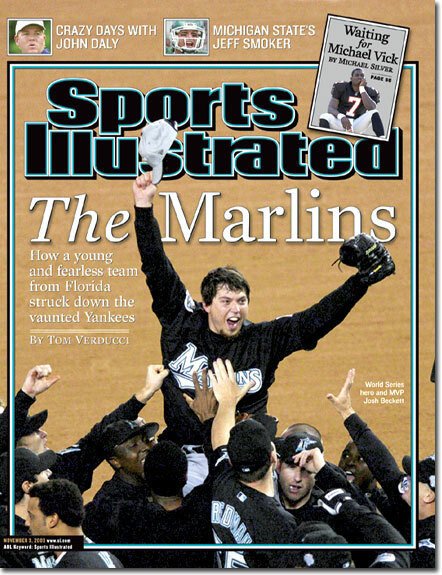 The Marlins rode the incredible pitching of Josh Beckett to beat the Yanks in 6 games. This team shocked the world more than the 1997 team. This squad was also younger and more inexperienced than the 1997 squad but proved themselves to be just a great. I decided to go with a one game championship to determine which World Series team was the best. The 2003 squad got the 2-0 lead in the top of the first inning. The 1997 team came up with 1 run in the bottom of the first to trail by only 1 run. The next and only additional runs of the game came in the 5th inning when the 1997 team put 2 runs on the board which would seal the victory. The 1997 team had 10 hits while the 2003 team had just 7 hits total. Kevin Brown won the game with 8 innings pitched and Rob Nen got the save. Gary Sheffield had a home run and 2 RBI’s in the winning effort. The losing pitcher was Carl Pavano and the 2003 team had runs scored by Juan Pierre and Luis Castillo the only RBI came from Derek Lee. This was a very tight game and had some good pitching from both teams. 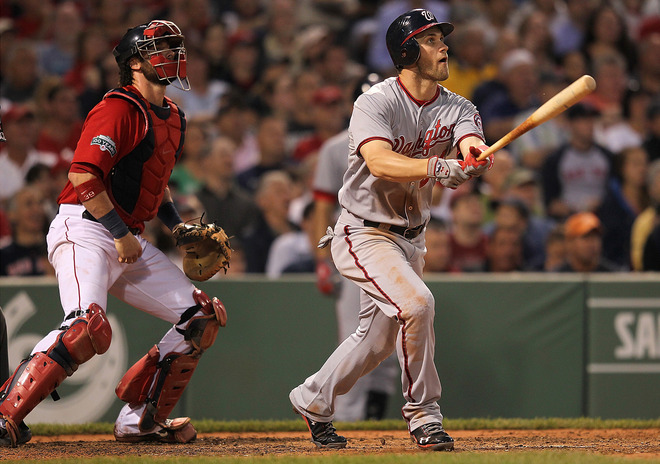 The offense of both teams was toned down a bit by both Kevin Brown and Carl Pavano. This was a dream match up that all Marlins fans would love to see but unfortunately we have only simulation. I feel that if we could see these two great teams face off this is the likely outcome. The 1997 team was more experienced and would have handled the game much better than the 2003 team. The offensive power was greater and the bats were better on the 1997 team. 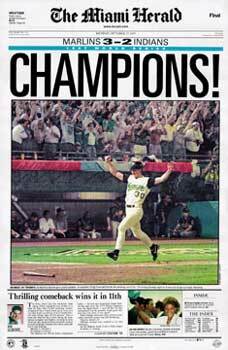 Both teams were great but on this night the 1997 Florida Marlins proved themselves to be the ultimate champions. Ozzie Guillen did it again and I am not surprised. He stuck his foot in his mouth again. It came out on Saturday night that the Marlins manager said in a recent magazine interview that he loves and respects the Cuban dictator Fidel Castro. The Marlins tried to kill it dead and separate them selves from his comments to no avail. The Cuban community in Miami, who are the very fans the club wants to bring to the new ballpark in huge numbers, feel alienated. Many are calling for his resignation as the teams manager. Some baseball analysts are calling for a suspension of at least 30 days. I think it is all too much. Ozzie tried apologizing during the weekend but it did not go over well. So on Tuesday he will use the teams off day to make a trip back to Miami to address the media about his comment. I am not sure what he can say to make this better or what the club will do to make this situation better if anything. I think he should be left alone after he apologizes. He has a track record of putting his foot in his mouth. The team knew that when they signed him. He did not say he condoned his actions in Cuba over the years. He just made a stupid statement about the dictator. We all know Ozzie is a great manager but he is also an idiot. I think everyone should take it easy and not make this bigger than it should be.